We introduce a method to minimize the mean square error (MSE) of an estimator which is derived from a classification. The method chooses an optimal discrimination threshold in the outcome of a classification algorithm and deals with the problem of unequal and unknown misclassification costs and class imbalance. The approach is applied to data from the MAGIC experiment in astronomy for choosing an optimal threshold for signal-background-separation. In this application one is interested in estimating the number of signal events in a dataset with very unfavorable signal to background ratio. Minimizing the MSE of the estimation is a rather general approach which can be adapted to various other applications, in which one wants to derive an estimator from a classification. 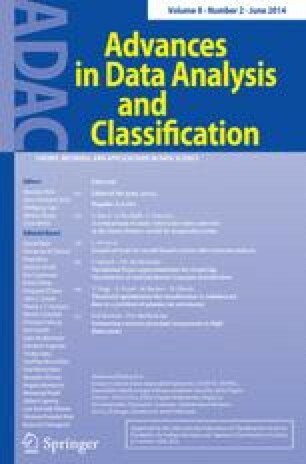 If the classification depends on other or additional parameters than the discrimination threshold, MSE minimization can be used to optimize these parameters as well. We illustrate this by optimizing the parameters of logistic regression, leading to relevant improvements of the current approach used in the MAGIC experiment. Part of the work on this paper has been supported by Deutsche Forschungsgemeinschaft (DFG) within the Collaborative Research Center SFB 876 “Providing Information by Resource-Constrained Analysis”, project C3 (http://www.sfb876.tu-dortmund.de). We gratefully acknowledge the MAGIC collaboration for supplying us with the test data sets. We thank the ITMC at TU Dortmund University for providing computer resources on LiDO. We thank the referees and the associate editor for their insight and valuable comments.